Model T Ford Forum: Can you identify the manufacturer? Can you identify the manufacturer? 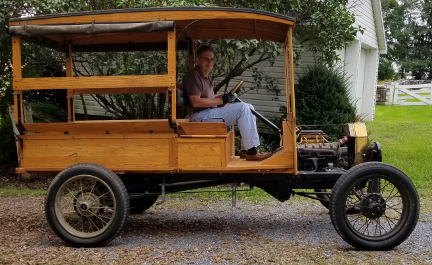 Model T Ford Forum: Forum 2018: Can you identify the manufacturer? Can you identify the company that manufactured the depot hack body in this photo? More of a "covered express" than a depot hack - hacks usually have multiple seats. Any idea of when it was produced? Syverson Cabinet Company of Desplains, IL produced wooden replacement / kit bodies back in the 70s. I don't know if they are still in business. My Syverson bodied speedster has a VERY small brass tag located on the seat riser. I have no idea when it was produced and it has no brass tag. Bummer. The firewall on my 09 was made by the Syverson company. I contacted Ray to see if date it for me and during the discussion I believe he also retired quite recently. The company moved several times and as they always put their name and town on the products, it is possible to determine when various items were fabricated. The body looks home made to me.